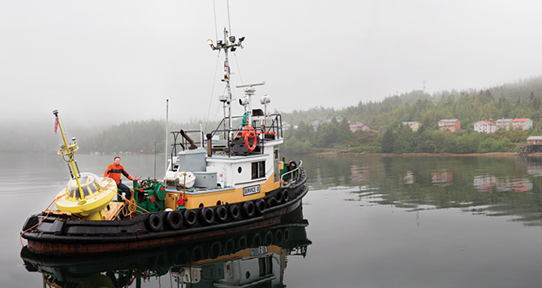 Wave energy could one day eliminate dependency on diesel for power in remote communities. 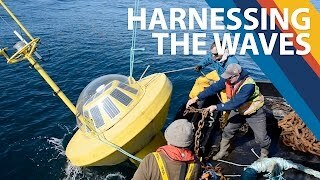 Brad Buckham’s West Coast Wave Initiative, in partnership with the Barkley Project Group, Hesquiaht First Nation and public and private sector collaborators, is discovering how wave energy technologies can integrate within a hydro-diesel energy system to cut emissions and foster community growth. Automated Testing Lab (ATLab) — Research areas include automated testing, combinatorial test generation, grammar-based test generation, and network vulnerability testing. Centre for Advanced Materials and Related Technology (CAMTEC) — Research areas include nanophotonics, nanomagnetism & spintronics, and biomaterials & medical applications. Centre for Advanced Security, Privacy & Information Systems Research (ASPIRe) — Research areas include cyber-security, cyber-privacy, and information systems. Combinatorial Algorithms Group (CAG) — Research areas include graph theory & graph algorithms, combinatorial algorithms, computational geometry, randomized algorithms, topological graph theory, computational biology, cryptography, and design theory. Communication Networks Laboratory (CNL) — Reseach areas include wireless/wireline interworking, medium access control, resource & mobility management, cooperative diversity systems & cognitive radio networks, smart Grid & EV, vehicular communication networks, data & networking privacy, and cyber physical systems. Computational Geometry & Robotics Lab (CGAR) — Research areas include computational geometry, sensor networks, robotics, and artificial intelligence. Computer Graphics & Gaming — Research areas include implicit modeling and animation, spatial computing (3D sensing), computational aesthetics, and game-based learning. Computer Human Interaction & Software Engineering (CHISEL) — Research areas include cognitive support & technology diffusion, human computer interaction, implications of technology use, social informatics, interface design, knowledge engineering, software engineering, technology & pedagogy, and visualization. Database & Data mining — Research areas include data mining, bioinformatics, automata & formal languages, search & ranking, algorithms for large social & web graphs, mining software repositories, and big data. Energy Systems and Transport Phenomena Lab (ESTP) — Research areas include fuel cells, transport phenomena, hydrogen dispersion and safety, and wind energy integrations. Fluid Mechanics Laboratory — Research areas include flow-induced noise and vibrations, aerodynamics, microchannel flows, and biomedical devices. Green Buildings & Structures — Research areas include high performance energy-efficient building envelopes, advanced methods of building energy use simulation & optimization, use & development of sustainable materials, development of light-weight durable structures with increased longevity to reduce environmental burden, timber structures, and innovative condition assessment & repair of existing buildings & structures. Industrial Ecology — Research areas include upstream ‘lifecycle’ impacts of materials, buildings & structures, interactions between infrastructure systems in national green growth strategies, resilient systems, resource recovery from waste streams, and groundwater footprints. Information Security and Privacy Research (InSPiRe) — Research areas include peer-to-peer botnets, malware classification, attacker/defender ecosystem simulations, situational awareness within enterprise-scale environments, long term security in large-scale systems, cloud resource management, QoS predictability within large-scale software systems, and controllability within clouds. Institute for Integrated Energy Systems (IESVic) — Research areas include hydrogen & fuel cell systems, renewable energy systems, transportation, energy systems analysis, energy efficiency, and carbon management. Laboratory for Advanced Wireless Communication Research (LAWCR) — Research areas include link adaptive transmission technique, cooperative relay transmission, massive MIMO transmission, green wireless communications, cognitive radio systems, optical wireless communications, and physical layer security. Laboratory for Applied Computer Vision Algorithms (ACVA) — Research areas include human motion analysis for health-related applications, surveillance-related motion analysis, perceptual interfaces, biomedical image analysis, and ocean engineering. Laboratory for Automation Communications and Information Systems Research (LACIR)- Specific research areas include adaptive optics systems, ocean technology and micro-machining. Language & Learning Lab — Research areas include machine learning, computational linguistics, and neuroscience. Learn, Engineer, Act, Design Lab (LEAD) — Research areas include software engineering, health informatics, software specifications & quality assurance, security & privacy, software safety, certification, usability, human computer interaction, and data & software reengineering. Modularity Squad (ModSquad) — Research areas include advanced modularity techniques for system infrastructure, con-currency, virtualization, mobile computing, and accessibility. Molecular Beam Epitaxy — Research areas include growth of III-V compound semiconductors & oxide materials on single crystal substrates, and their electronic & optical properties. Music Information and Sound Technology Intesciplinary Centre (MISTIC) — Research areas include new methods for controlling instruments, interactive context-aware music borrowing, musical robots, and music information retrieval. Numerical Analysis — Research areas include computational matrix theory, linear algebra, numerical analysis, and graph theory. Ocean Engineering Research (OER) Group — Research areas include autonomous and remotely operated underwater vehicles; sub-sea fibre-optic linked observatories; high resolution acoustic imaging & mapping; acoustical oceanography; acoustic communications; sub-sea navigation; ocean power generation, marine mammal tracking; and benthic monitoring. Parallel, Networking & Distributed Applications (Panda) — Research areas include cloud computing, online social networks, software defined networks, smart grid, green computing, mobile computing, wireless communication networks, mobile ad hoc networks, and protocol design & performance evaluation applied network security. Practical Interdisciplinary Tractable Algorithms (PITA) — Research areas include parameterized complexity, computational biology, and human problem solving. Remote Sensing Software Engineering Group (R SENG) — Research areas include Kyoto Protocol classification system, measuring chemical properties of Canada's forests from space, estimating 3-D properties of forests, distributed hyperspectral & segmentation, and processing overgrid architectures. RIGI research — research areas include self-adaptive software systems, context awareness, cyber physical systems, and smart applications. Robotics and Mechanisms Laboratory (RAM) - The Robotics and Mechanisms (RAM) Laboratory, University of Victoria, is concerned with the design and implementation of manipulation devices including robots and mechanisms. Research is performed on both analysis and synthesis topics. SIMBIOSES Research Group: Sensors and Imaging for Biomedical Systems - This interdisciplinary research group conducts research and development on the intersection of software engineering, imaging and biomedical sciences. Software Engineering and Systems - Research areas include software engineering; software specifications & testing; compilers; programming language implementation; data and software reverse engineering; experimental software engineering; human computer interaction; and information visualization. Software Engineering Global InterAction Lab (SEGAL) — Research areas include collaborative software engineering, coordination & communication in software engineering, software ecosystems, education in software engineering, and global software development. Sustainable Cities & Infrastructure — Research areas include infrastructure solutions for the dual challenge of climate change adaptation & mitigation in cities, strategies for the development of carbon neutral cities, including the economic & environmental impacts of emerging “electric cities”, development of quantitative methods for assessing & improving the resilience of urban infrastructure, modeling & optimization of community-scale energy systems, and geotechnical engineering for sustainable urban environments. Sustainable Systems Design Lab (SSDL) — Research areas include wind energy, tidal energy, wave energy, energy systems analysis, and transportation. UVic Microfluidics Lab - Focusing on developing an understanding of transport phenomena in micro- and nanostructures and applying this understanding to develop devices with new functionality and applicability. Visual Interaction Design (VisID) — Research areas include collaborative visualization, computer support for building design & construction, multidimensional data visualization, and casual information visualization. Water Sustainability — Research areas include techniques for understanding groundwater depletion & sustainability, mapping of global permeability & porosity, modeling of continental-scale groundwater systems, water & wastewater treatment process for both high-tech & low-resource environments, and development & evaluation of humanitarian emergency water supply & sanitation technologies. West Coast Wave Initiative (WCWI) — Research areas include wave energy resource assessment methods, numerical simulation tools for Wave Energy Converters, and numerical grid integration toolboxes. 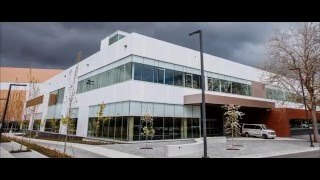 See more videos from the Engineering centres playlist on YouTube.